by Bill Dwight on Thursday, March 24, 2011 at 12:48 PM | LEAVE A COMMENT! We’re constantly scouring the Internet looking for articles related to family finances and teaching kids good personal finance habits. You can visit the FamZoo delicious page to see our ever growing list of family finance bookmarks. We’re up to 1213 now! Each week, we pick our favorite articles from the previous week and post them here. 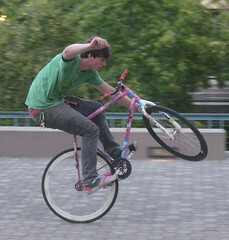 David uses his son’s “fixie fixation” to impart several sound financial lessons. My son’s been a fixed gear biking fanatic and competitor for many years (see picture and video), so I couldn’t pass this one up. Besides, it’s a solid article that covers a very effective financial education technique. Does your child have his or her heart set on a big purchase or an expensive hobby? Don’t miss a golden opportunity to instill a little financial wisdom along the way. See how David’s doing it here. Matt lists three key roles to fill while mentoring your kids on money matters: gatekeeper, teacher, role model. Notice how “Best Buddy” isn’t on that list. I think it’s critical to be father (or mother) first, and friend second. That’s why when I hear "Oh dude" muttered under the breath in response to a piece of parental discipline, I typically reply: “I’m Dad, not Dude.” Someone’s gotta be the bad guy. Read Matt’s breakdown on the three money mentor roles here. As a software guy, I’m a natural fan of simple yes/no logic. You know, with computers, it’s ultimately all about ones and zeros. Unfortunately, parenting is way messier than that — lots of shades of gray. Context is so crucial. I’ve found that the same tool can be applied in very different ways with dramatically different results. Stop paying your kids an allowance. You’re ruining them. Maybe. Maybe not. I’d say it depends upon how you’re applying the tool. It also depends on the kid. But he’s still not totally convinced. Why not? Read here. Life just isn’t binary, no matter what the experts say.